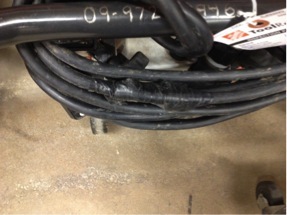 FCS16-1000A Extension Cord used with the FCS16 RIP-R-STRIPPER Tile Stripper improperly repaired. FIGURE 1. In this case, it is presumed the RIP-R-STRIPPER Blade had come in contact with the extension cord and accidently cut it. Unfortunately, the Technician did not repair the cord according to National Electric Code practices by using the electrical tape. A replacement extension cord is expensive and you can save money by properly repairing a damaged cord. Improper electrical cable splicing techniques can result in property damage and /or personal injury! It is not legal to splice electrical extension cords. Even if you solder the wire, wrap each wire with electrical tape and encase the whole splice in heat shrinkable tubing, it still will not have the abrasion resistance of a new cord. Plus, this practice is not permitted under the National Electric Code. Instead, install a high quality NEMA L5-15P locking male plug and NEMA L5-15R locking female receptacle to the cut/severed extension cordends. These devices have a twist lock feature which will prevent them from separating when the extension cord is pulled around during normal tile stripping job applications. 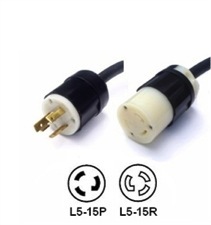 A typical NEMA L5-15P Locking Male Plug and a typical NEMA L5-15R Locking Female Receptacle are both depicted in FIGURE 2. These electrical cable connecting devices are readily available in the field. Follow the installation instructions provided. Not using devices with the twist lock feature will allow the plug and receptacle to separate as the RIP-R-STRIPPER moves around on the jobsite. Always follow repair procedures as specified by the current National Electric Code. Remember…safety is everyone’s responsibility! 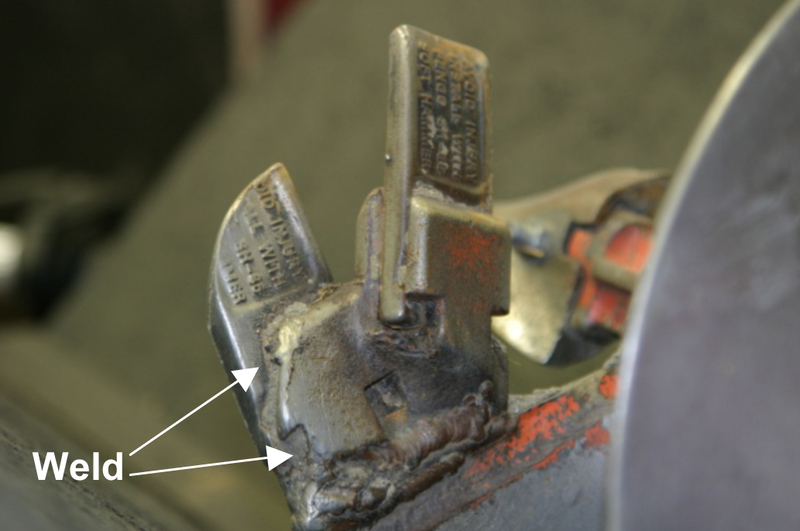 Improper throttle cable install can increase the potential for personal injury. FIGURE 1. 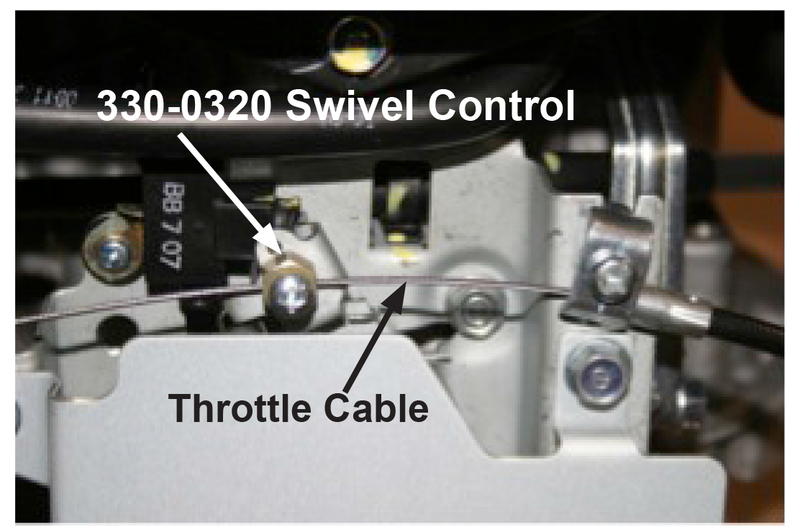 The throttle cable installation depicted will significantly reduce operator control while using the twist grip throttle system and could directly contribute to personal injury. 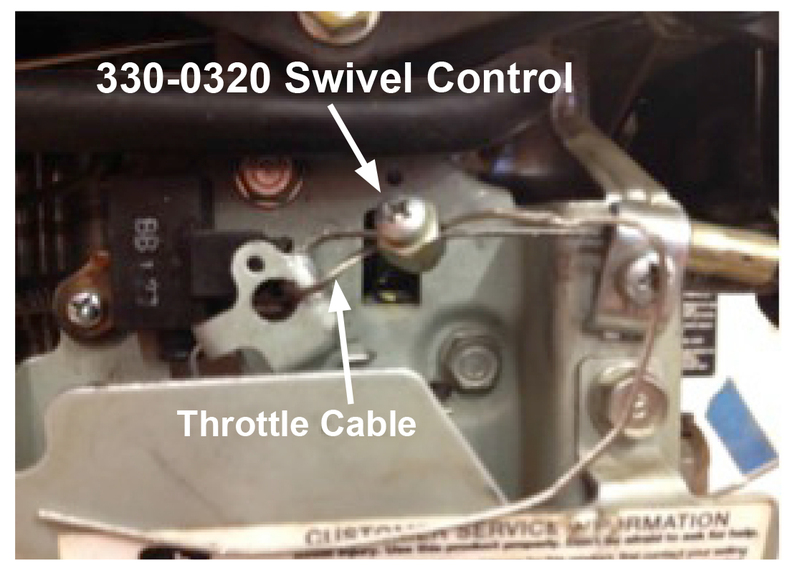 Extended use of this installation can allow the throttle cable to be severed by the carburetor throttle mechanism leading and could directly contribute to personal injury. Correct installation will position and secure the Part Number 330-0320 Swivel Assembly in the hole provided on the carburetor throttle mechanism. The 330-0320 Swivel Control is designed to rotate as necessary to minimize throttle cable wear and provide for enhanced operator control. FIGURE 2. To help reduce the potential for personal injury, it is critical for all throttle mechanism components be properly installed and maintained. The throttle control system must be inspected every time the Two Man Auger is turned. Refer to the applicable Tool Turning Tips publication for additional information. http://www.generalequip.com/Library. Form: GEF16101202. For 2014, there are changes in the bits that utilized with the General 330H Two Man Auger. These are the first significant change in the bit boring head design in over 50 years! This is an update to help provide further information to correctly order replacement parts. Eliminates the 140CS Drive Lug. 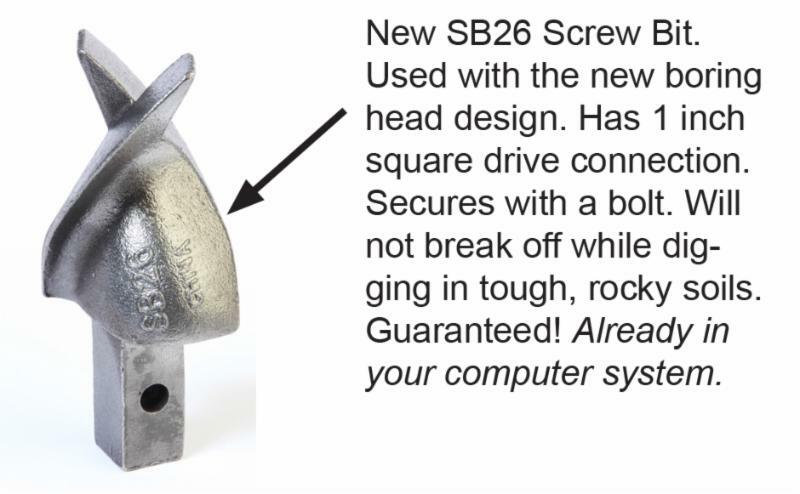 Replaces the SB25 Screw Bit with the new SB26 Screw Bit. The SB26 Screw Bit design eliminates any potential breakage from the 140CS Drive Lug. Features a one piece, steel casting assembly with the specific bit diameter and General logo molded into it. Sophisticated software was used to optimize tooth angle and position. The new design better allows the bit to be more easily robotically welded. Robotic welding will increase manufacturing consistency and quality. So…what’s the big deal? A bit is a bit. Right? Well, the big deal is this: General is doing something different to manufacture a bit that digs better and lasts longer. The new 4450 Series bits are available in popular sizes: 6, 8, 10 and 12 inch diameter. Look for them beginning in February! Question: What Happens if a General Two Man Hole Digger is Operated Without Oil in the Transmission? All General Two Man Hole Diggers use 10W30 or 30 weight oil to lubricate the transmission gears and bearings. The same oil that you use to also fill the engine. Units are shipped from the factory with oil provided in separate plastic bottles for both the engine and transmission. Recently, a warranty claim was filed for a Hole Digger that had been placed in service only three months earlier. The claim was the transmission was defective. • The oil fill plug had never been removed. • The transmission had never been filled with oil. • The lack of lubrication produced significant and costly internal damage. • The damage was not covered by warranty. General hole digging products are overbuilt for heavy duty usage and will deliver years of satisfactory service with just regular maintenance. However, for that to happen, it is critically important that the correct amount and type of oil be used to fill both the engine and transmission! It’s summertime and augers are in high demand. Is is time for some very much needed auger maintenance? Summer activity increases the demand for renting augers. It also increases the wear rates for high wear parts, including teeth, blades and screw bits. Good bit maintenance practices will provide your customers with higher satisfaction from their rental experience. That means more repeat customers! Take a look. 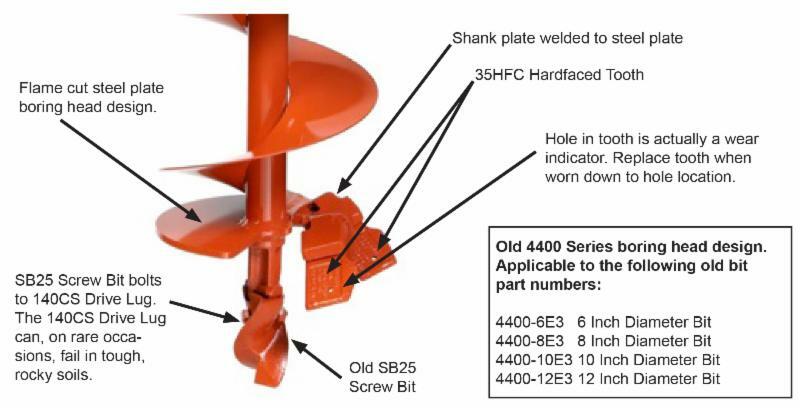 Is it time to replace those worn parts on your Two Man augers? Note the hole provided in the 35HFC Tooth. The hole is a wear indicator. When the tooth wears down to the hole, it is time to replace the tooth! Protect your investment. This is what happens when teeth are not replaced as needed. The replacement tooth was then welded to secure it to the bit shank plate. When the tooth further wears, the auger can only be scrapped. Protect your investment! Poor maintenance allowed this auger to be rented without a Screw Bit or tip bolted to the drive lug. Do you have Two Man auger that look like this? If so, they need to be scrapped because of safety and performance considerations. Protect your investment! 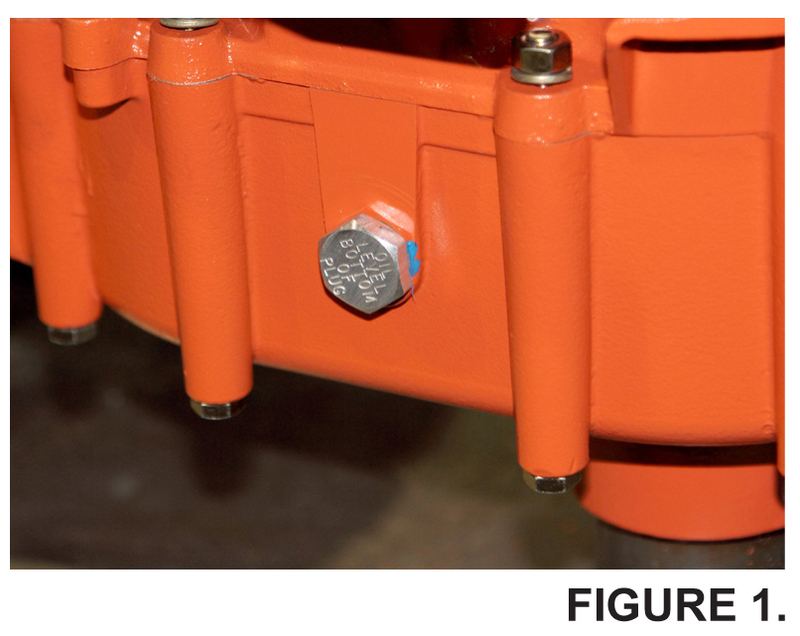 Questions: How do you check the transmission oil level in 300 Series Hole Diggers? Answer: Follow procedure in the Operator Manual. Note: This information applies only to the General 330H, 343H and 357H Hole Diggers. 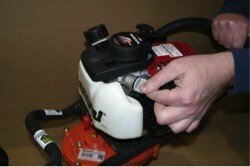 300 Series Hole Diggers are shipped from the factory without oil in the transmission. Oil is provided in the original shipping carton. Failure to properly fill and operate the transmission with oil can result in damage that is not covered by the product warranty program. Steps below to check oil level. Do not check oil level with the engine running! Place the Hole Digger on a level surface. Wipe any dust or dirt from the transmission oil filler/level plug area. The oil filler/level plug is located on the side of the transmission. FIGURE 1. Remove the plug with a suitable wrench. FIGURE 2. 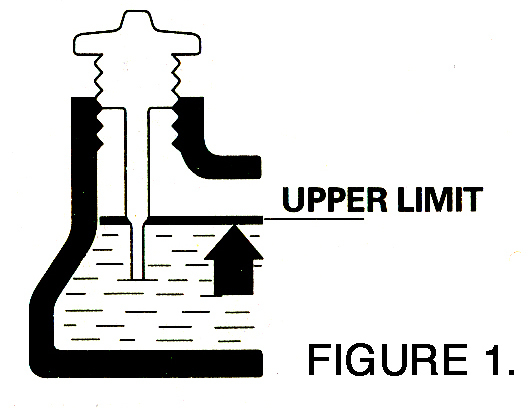 The transmission oil level is to be maintained at the bottom of the oil filler/level plug hole. FIGURE 3. If the oil level is not visible add oil up to bottom of the hole. DO NOT OVERFILL. Allow excess oil to drain out of the transmission if overfilled. Inspect the oil fill plug gasket for proper security. If necessary, replace the gasket with a factory approved replacement part only. FIGURE 4. Reinstall the oil filler/level plug. 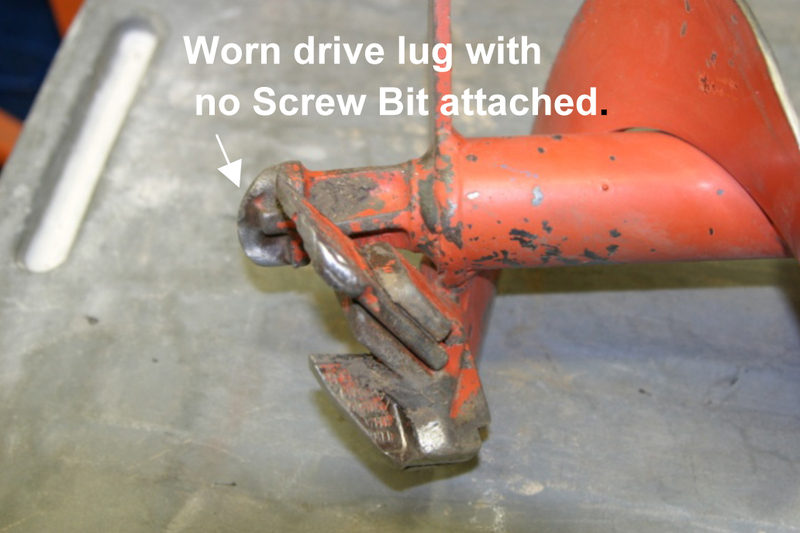 Tighten securely with a suitable wrench. FIGURE 2. Wipe off any excess spilled oil. Properly dispose of any spilled oil. Correct oil level is important to insure proper centrifugal clutch operation. Excessive oil level will cause excessive clutch slippage. Low oil level will cause improper lubrication. Both conditions will cause high operating temperatures that will reduce service life and affect digging performance. Service related problems as a result of improper transmission lubrication are not covered by the product warranty program. Consult the Operator Manual for additional information. URL: http://www.generalequip.com/prod_library/267-item.pdf into a browser. Questions: What is the Correct Method to Check Oil Level for the Honda GXV140 and GXV160 Engine? Answer: Check According to the Honda Developed Procedure. Note: This eHelp! only applies to the General 330H, 343H and 357H Hole Digger powered by the Honda GXV140 and GXV160 engines! Filling the engine crankcase with oil will require a level working platform of sufficient size and appropriate height. As an alternative, the transmission driveshaft can be securely in a suitable bench vise. Running the engine with insufficient oil can cause serious engine damage. Wipe any dust or dirt from the crankcase dipstick/filler plug area. Remove the oil filler cap/dipstick and wipe clean. Insert the oil filler cap/dipstick into the oil filler neck as shown, but do not screw it in. Remove it to check the oil level. FIGURE 1. Screw in the filler cap/dipstick securely. Wipe off any excess spilled oil. Properly dispose of any spilled oil. 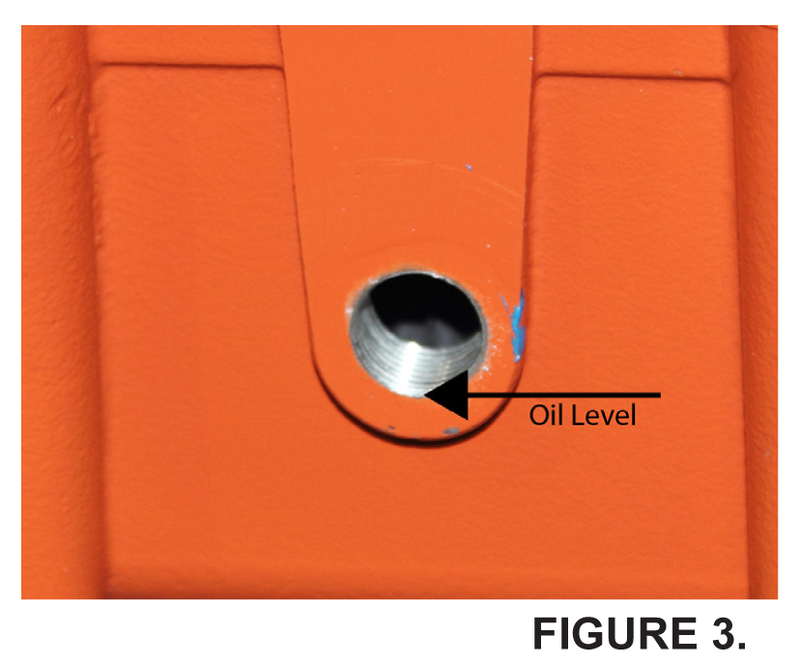 Failure to follow correct procedures can give an inaccurate oil level reading. The correct oil capacity for the Honda GXV160 engine is .65 Liter or 23 US fluid ounces. Refer to the Owner’s Manual supplied by Honda for additional information including type and weight. Service related problems as a result of improperly filling the engine with oil are NOT covered by the Honda warranty program. URL: http://engines.honda.com/pdf/manuals/31ZE6030.pdf into a browser. Part Number, Description and Application. Description: Blade, straight, 4” x 6” wide, dual beveled edge. 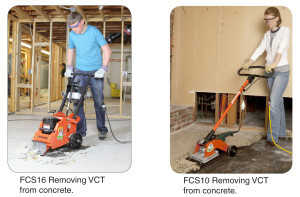 Application: For use with general purpose removal projects on both concrete and wood surfaces. For use with FCS10, FCS16. Description: Blade, straight, 3” x 10”, single beveled edge. 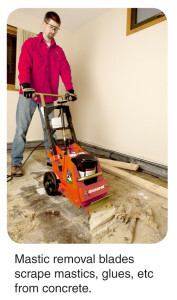 Application: For use with general removal projects on both concrete and wood floors. Description: Blade, mastic removal, 6” wide, single beveled edge. Application: For removing mastic and thin film coverings from concrete floors ONLY. For use with FCS10, FCS16. Description: Blade, scoring, 8” wide, beveled edge FACING UP. 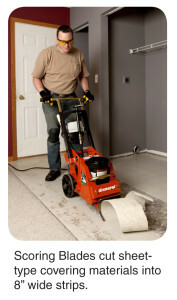 Application: For use removing glued carpet and sheet type linoleum, rubber, PVC etc. coverings from concrete surfaces ONLY. For use with FCS10, FCS16. Description: Blade, scoring, 8” wide, beveled edge FACING DOWN. Application: For use removing glued carpet and sheet type linoleum, rubber, PVC etc. coverings from wood surfaces ONLY. Questions: Correct Method to Check Oil Level for the Honda GX35 Engine? Note: This eHelp! only applies to the General 240H Hole Digger powered by the Honda GX35 engine! It does NOT apply to the 240 Hole Digger powered by the Subaru EH035V engine. We have received field reports of the Honda GX35 engine not operating properly due to engine oil exiting the air cleaner through the crankcase vent. The cause of the problem is an excessive oil level in the crankcase. Operation of the engine then forces oil through the crankcase breather vent. 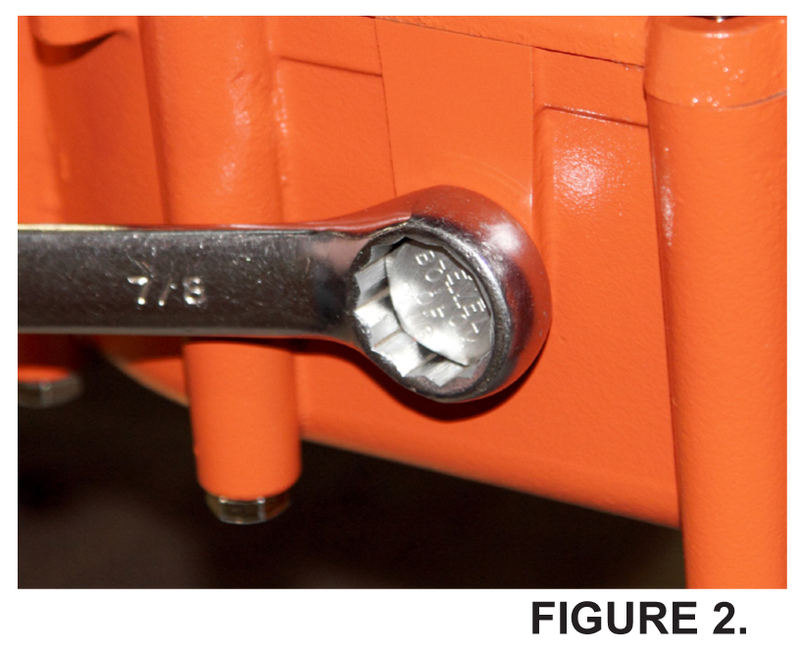 Position the 240H Hole Digger upright with the throttle control in contact with a suitable surface as depicted in FIGURE 1. Hold the fuel tank level or parallel relative to the surface. Replace the dipstick and secure finger tight. FIGURE 1. Note that fuel tank is positioned level or parallel relative with the surface. pumped out as the engine operates. Position a shop towel under and around the engine spark plug to prevent oil from staining clothing and other personal property. Pull the recoil starter and expect oil to rapidly exit the spark plug hole. Repeat this step until oil no longer exits. This will eliminate engine damage cause by hydro locking. Drain oil from the crankcase until the oil just shows on the tip of the dipstick. Run the engine for several minutes and then recheck the oil level. If the oil level has increased, drain the excess oil so that the level is again just to the tip of the dipstick. Repeat this procedure until the oil level no longer increases after the engine is run. Do NOT check the oil level with the engine positioned as in FIGURE 2. This procedure can allow the crankcase to be filled with excess oil. 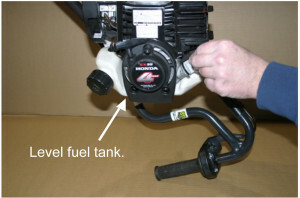 FIGURE 2 depicting the improper method to check oil level for the Honda GX35 engine. The correct oil capacity for the Honda GX35 engine is 100 cc or 3.4 fluid ounces. Refer to the Owner’s Manual supplied by Honda for additional information including type and weight. Service related problems, as a result of filling the engine with excessive oil, are NOT covered by Honda warranty program. Allen Head-Type Capscrews to Clamp the Blade? Answer: To Minimize being Cut by the Sharp Blade. RIP-R-STRIPPER® blades are manufactured from special, high carbon steel, heat treated for longer service life and then ground to produce an extremely sharp edge that maximize cutting efficiencies in a wide variety of covering materials and adhesives. 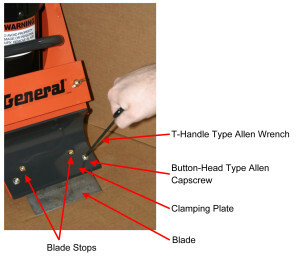 The Button-Head, Allen-type capscrews and a long T-handled-type Allen wrench keep the hand and other body parts clear of the sharp blade edge. Allen-type capscrews are classified as Grade 8, the strongest type of capscrew available for this application. The rounded, button-head configuration is intended to help lose materials to better flow up and around the Clamping Plate. 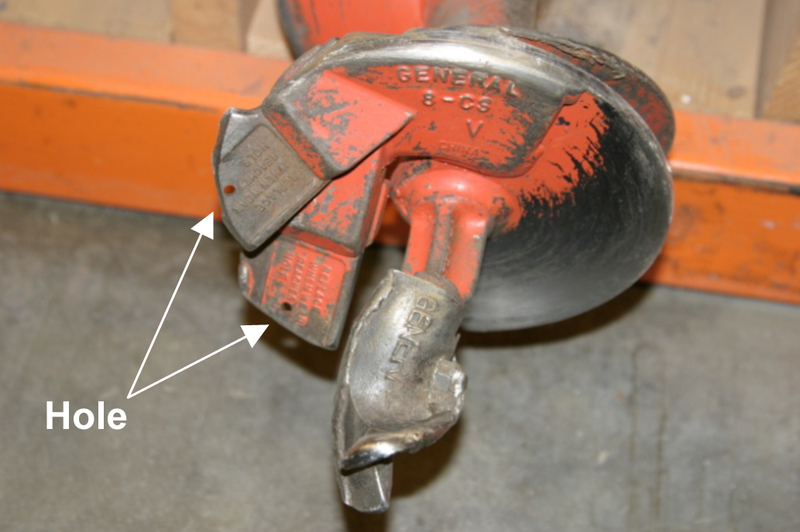 When the original factory Bottom-Head, Allen-type capscrews become worn, damaged, or lost, replace with Part Number 55050600 (5/16-18 UNC x ¾” long, plated) ONLY. Grade 2 and 5 capscrews are not as strong as Grade 8, Allen-type capscrews. 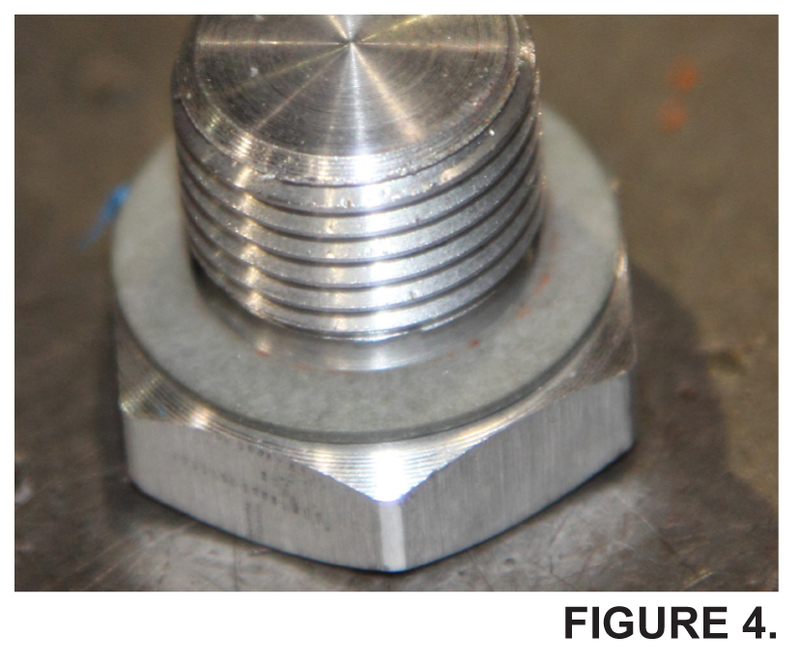 The use of hexagon head-type capscrews will prevent lose materials from properly flowing up and around the Clamping Plate. 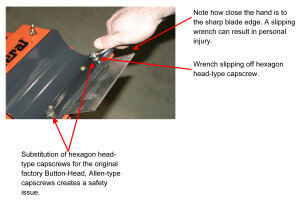 A combination wrench can slip off the hex head capscrew and cause personal injury.